It is especially quick and easy to make this dish at home if you have a handy dandy apple slicer that will cut out the core and cut the rest into pieces. You can find these inexpensive tools at most grocery stores (or Target), and they will easily cut your prep time in half. Not to mention they come in handy for just slicing apples for a snack (or even pears too!). 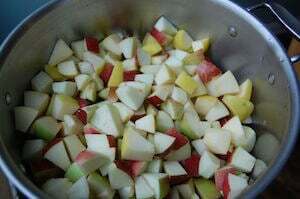 Combine the apples, apple juice/cider, lemon juice, and cinnamon stick (if using) into a large pot. Cover and simmer for 20 – 25 minutes or until tender (but not mushy). Remove the cinnamon stick (if using) and transfer warm apple mixture to a food processor (or you can mash by hand with a potato masher) and add honey (if using) and nutmeg. Puree to desired chunkiness. Serve, refrigerate, or freeze the leftovers! I am thinking about making applesauce this fall with my kids. All the recipes I’ve seen call for processing the cooked apples through a food mill to remove the skin. How is the texture of this recipe when the food processor is used? Can it be smooth at all? It is still smooth (even with the peels on) although you do find yourself chewing a little bit when you eat it. You could definitely take the peels off if that is how you prefer to have it…I am just all about cutting out steps if I can! We make it at home in apple season too. We don’t process through a food mill, but I usually peel the apples because I have a picky eater who doesn’t like the skins. Hmm, maybe I’ll try using the hand blender and see what he thinks. Thanks for the idea! Mmmm…walnuts sound like a great addition. Thanks for the tip! I steam my apples and don’t peel them when I make applesauce! Yummy!! So excited to see a new post.. I am hoping there will be other recipes you will be able to share from past posts that you haven’t gotten around to yet. (I am patient) and we loved the ravioli, although my pasta was too thick, I guess and big(gotta work on that)! Thanks again for sharing… how about a healthy pumpkin bread recipe?? So now I am curious…was there anything in particular you were waiting on that I talked about on the 100 days site and haven’t posted a recipe for yet? Just checking! And figuring out a pumpkin bread recipe is a great idea. Thanks! 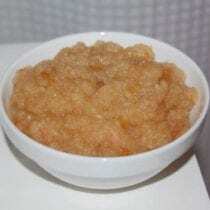 I make homemade applesauce all the time too! I’m so thrilled that it’s apple season again. I have to admit I eat an apple everyday, whether it’s in season or not. I have a stick blender and never think to use it…thanks for the reminder! And I agree you do find yourself “chewing” a little when the skins are left on. I just hate doing extra work that I don’t think is completely necessary. And per your suggestion I will add an “optional” next to the honey ingredient! Mmmm… warm applesauce with raisins and walnuts on top of a whole-wheat waffle… mmmm! I know that I am a bit late on this post. I just discovered your site last night and have been reading since then. I noticed where you have stated that oil is your weakness. You can substitute unsweetened/plain apple sauce for any oil in your baking (with the exception of oiling your pan). It works like a charm and I honestly can not taste the difference. Made this today exactly as it was listed. OH.MY.WORD. Everyone loves it!!! Going to the apple orchard tomorrow to get a bushel to make more apple favs! How long will this stay good for in the refrigerator and freezer?? It would last in the freezer for months. In the fridge no more than week…. I have a family of 7. I was wondering roughly how much does this recipe make? It should be plenty for 7 people! I was wondering if you could can this applesauce? My mom always said that when making homemade applesauce to can, you should omit the sugar and then just add it in after you open the can. Since this uses syrup, I was wondering if I would do something similar or if I could make this recipe and then can it as is? I wish I could answer that, but I’ve never “canned” anything before…I am actually taking a class on it at a local farm this week! This sounds way better than my applesauce recipe. I am going to try it tonight. We use ginger instead of nutmeg. Gives it a taste reminiscent of a gingerbread cookie! I just discovered your site a few months ago and I love it! I’ve made this applesauce recipe three times now, and loved it every time!! I experimented with it a little bit by mixing different types of fruit. Thought I’d share in case anyone else was interested–first I tried mixing apples with pears and it turned out great. I kept everything the same, just did 3 lbs of apples and pears combined (I left the skins on the pears). This last time I tried apples with peaches (with skins)–again it turned out great! Thanks so much for the great recipes!! As school days are quickly approaching, I am currently in lunch planning mode for my kids. My silicone ice pop molds arrived today. I’d only planned to use them for smoothies, but now will be sending this applesauce in them as well! Have you had any issues with leaking when using non frozen foods? This is my absolute favorite late night treat! Whenever I have a sweet tooth – I warm up the applesauce, drizzle a little honey, top with some pecans and YUM! Sweet Tooth fixed! I read through a few of the posts and was excited to see so many making their own applesauce. I have made it the last few years and my kids love it. We peel our apples and I just bought an old-fashioned applepeeler, which makes it go very fast. Good investment for $20. You can “can” the applesauce using hot mason jars, a hot lid, and boiling water bath to process it. We do this and it is really great. No need for a pressure cooker. I just heat the jars with hot tap water, boil the lids to sterilize and then put hot applesauce into the jars. Seal with a ring and process all jars in a large stock pot for 20 minutes. You want to put a upturned pie pan or trivet in the bottom of the pot, so the jars don’t have direct contact with the bottom. Cover and process. If they seal properly, you will hear a “pop” about 2-6 hours later. The middle indent will also be down (in case you’re not around to hear). Last thing. If you want variety in your applesauce, I add fresh or frozen strawberries, blackberries, blueberries, peaches, mango or whatever I have on hand to make flavored applesauce like they sell at the store. You might need a bit more sweetener, but the kids love this! It doesn’t need to be a lot, about a cup or so for a 5 pint batch. Could I use an apple/peeler/core/slicer? It makes the apples pretty thin, but is super fast. Would that change the cooking time? Thanks for all your fabulous recipes! If I use the optional cinnamon stick, do I put it in whole? And does it go into the food processor at the last step too? I will never buy applesauce again. This tastes wonderful and I was able to cook it while also cooking your Tomato Bisque. Super easy and amazing! Thanks for the great recipes. Thanks so much for posting a great recipe that does not include all that sugar!! So easy and yummy!!! I just made this and it’s so so good. I can’t believe how easy it is and without all the sugar. Thanks. Laura, Skinnytaste has a recipe that is pretty much the same as this (minus apple juice/cider) that you cook on low in a crock pot for 6 hours. I make some about every 2-3 weeks and my 2 year old LOVES it! What do you mean when you say cooking apples? Are there some apples that you want to avoid using? I always thought I didn’t like apples mostly because of their texture. What I have realized is that i just don’t like red delicious. Honey crisp is worth the extra price. I now live in upstate NY with lots of apple orchards and am enjoying trying all the new varieties! Tracy, I too didn’t care for Red Delicious apples either. My husband, a northern California native, introduced me to Braeburn apples – they’re so crispy and flavorful, and I’ve not touched a Red Delicious in over 15 years. You can find U.S. grown, but off-season they’re typically imported from New Zealand. Tracy, have you tried Cortland apples? I’ve only seen them in upstate NY and they’re delicious. Picking them this week too! Wondering how many cups the 3 lbs ends up to be. I’m excited to try this. I make this without the apple juice or cider as I rarely have this on hand. Instead, I just use a little water. It is so easy and so tasty. Just wondering if you put the cinnamon stick in the food processor as well? I just made this, and it was delicious! We live in Upstate New York, and it is apple season! I used fresh picked Cortland apples (because that is what was ripe), and I didn’t need any honey at all. The applesauce was perfect with the cider and cinnamon (I didn’t have a stick so I used 1/4 tsp of ground cinnamon). I looked up a few recipes before finding this one, and they all called for a ton of white sugar. If I had added it, I can’t even imagine how sweet it would have been, because it is perfect without it! Thank you for all of the great recipes! What kind of apple juice do you use? Store bought? You were right, it was simple and great tasting! Thanks! Remind me why I ever bought applesauce? Easy peasy is right. I omitted the honey (b/c I didn’t have any) and used a stick blender (I drained a bit of the juice 1/2 thru blending b/c mine was a little too runny). The house smelled heavenly. I used 3 lbs chopped apples (not counting the cores) and ended up with just over 4 cups of applesauce. Deeelish. Do you keep the skins on? The nutmeg was too much for my girls but other than that we loved it. The consistency was like that of baby applesauce, I really liked that. Hi, I understand that it’s not necessary to peel the skin but can you “feel” the skin when it’s done? My girls really have some texture issues when it comes to food. Bought all the ingredients and realized I was out if lemons when I get home. Are there any reasonable substitutes? Or should I just wait until I can get back to the store? Thanks! I am buying a food processor for this recipe since I don’t yet have one. How big of a food processor do you need? Is a 4 cup food processor big enough? Or do you need a larger one – such as a 7 cup? I juiced the cores instead of using bottled apple juice. It came out great! Just made this and it is great. Will double or triple the receipe next time. Just made for the first time today and turned out great!! Thanks for all your hard work, this site has really helped me make changes in my family’s eating habits! I used to love helping my mom make applesauce and now I enjoy doing it myself! We just quarter the apples, core and all, and drop them in a big pot with maybe a cup of water. Then we cook up until soft, and run them through an old fashioned Foley Food Mill. Keeps the skins and seeds up top, but lets all the fresh cooked sauce through the bottom. It turns bright pink and we’re only left with a little waste! So tasty! Mom makes enough every fall to freeze and last the entire year! This is so simple and the kids loved it. This recipe is a keeper. When I made this it turned really brown. Is that normal? Can I use ground cinnamon instead of a stick or would you advise leaving out the cinnamon if I do not have a stick of cinnamon? If it will work just as well with ground cinnamon, how much would you recommend? If I don’t have a food processor, can I just use the blender, as for other recipes as well? Can I use water instead of cider or apple juice? cool blog, lots of good ideas. I really liked the natural beauty treatments. Thanks!! I typically freeze and can applesauce. Would this be a recipe that I could also can? Or would you not recommend it? Thank you for any insight. Mmmm, I will have to try this with all the pears coming from my tree right now! I just picked up 25# of an apple called No Name from one of our local farms (its a hybrid they created…hence the name No Name lol)I’m going to try out the crock pot way tomorrow so I can focus on getting my homework done while it cooks. I absolutely love the fact that if I want to make something specific 9 times out of 10 I can go to this blog and can find a recipe for whatever it is I wish to make. Another huge bonus as a busy mom is I normally have the dry Ingredients on hand. It’s terrific. We love unsweetened applesauce for eating and baking but also making seasonal apple butter. I love this recipe because we can multiple it and follow it easily without adding the honey and spices. Then puree, spilt in half freeze the unsweetened portions (to be flavored however later) then add the apple butter portion back to the pot. We spice it accordingly, simmer low for an hour and then freeze. If doing this though make sure you strain the cooking juice but don’t discard before processing/mashing. Apple butter should be thicker in consistency then applesauce and I like to add juice back as needed. 1 pot and 1 mess to clean up but two different products. Jocelyn, What is your apple butter recipe? Fantastic – we used local, organic honeycrisp apples and this will be a yearly fall routine going forward! Thank you! This applesauce looks yummy! 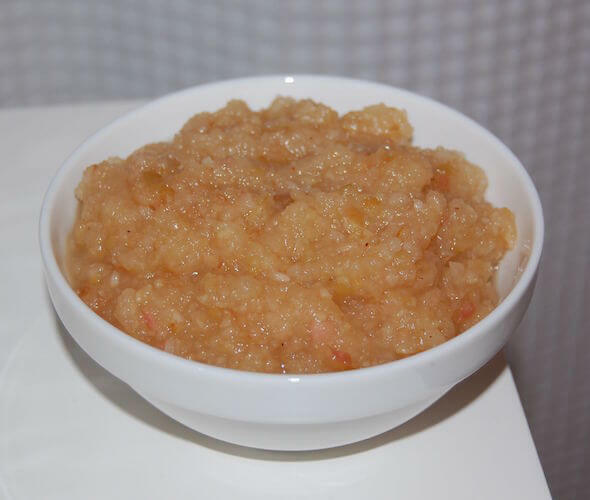 I usually make a much simpler homemade applesauce in the slow cooker for my 2 year old and he loves it! I use 3 sweet apples, 3 Granny Smith apples, a teaspoon of cinnamon, a pinch of nutmeg, and a tablespoon of water. That’s it! It’s delicious without the added sugar (honey, etc.)! I have made applesauce for years but this is the first time I used lemon juice and apple cider vinegar. It is a little too acidic tasting for me…any ideas on how to change that taste/flavor? Oh, the recipe said apple cider or apple juice, not apple cider vinegar. ;) I bet it WAS acidic with the vinegar! Pays to read a recipe a few times before you cook it. I had made another batch my old way and ended up mixing both together and it tastes fine! I am making the Easy Peasy Applesauce today (LOVE this website!) but it doesn’t say to take the cinnamon stick out before turning the food proccesor on. I’m assuming I take it out?? I’ve never used a cinnamon stick before…wasn’t sure? Just made this and it is so yummy! I accidentally added the honey before simmering and it turned out fine. My kids love this recipe too. This is a PERFECT recipe! Tastes fantastic! Thanks. Hi Lisa, thanks for this recipe, I’m making it right now for my son who has not been well and needs some home made organic apple sauce for his tummy. I don’t know if you know this but there is an add “banner” for McDonalds on this page of your blog. I am a bit surprised to see it here. Thanks for this recipe!! Can I use water instead of apple juice? Hi. You can. The muffin will likely be less moist and sweet. I wonder if I could do this in a crock pot? Ok, so I did this recipe in the crockpot! I doubled the recipe and cooked it on high for 4 hours. It turned out great! I core my apples, chop into large chunks and put them in the food processor to a large dice before I cook them. Then when they’re cooked, their done! Do you have to cook the apples? I’ve made “emergency” apple sauce in the past by literally throwing apples into the blend tec with a bit of cinnamon. But it wasn’t to put away or freeze, it was to eat right then. I mean- why bother having pork chops if you don’t have apple sauce? Is the cooking so that it can be stored or frozen? Either way, I plan to try this recipe! Also- didn’t realize you were in NC. I’m in Chapel Hill! Yes, apple sauce is typically made with cooked. apples. I just made this using an assortment of apples that were soft and bruised – granny smith, red delicious, gala and honeycrisp. It is delicious and I didn’t need to add any sugar because the apples were overripe and had plenty of their own sweetness.